Amazing offer on screen printed tote bags – £0.75 per bag! At Garment Printing we offer 500 personalised printed tote bags at the incredible price of £0.75 per bag, with free delivery. Make the most of this unbeatable offer and get your tote bags printed for next to nothing. The tote bag printing UK offer is something that we have running all year round as printed canvas bags are one of our most popular products. Get in contact with our sales team and order yours today. Due to this fantastic offer, those who plan on selling the bags can save a great deal of money in the production of the product. The same applies for those who wish to use them as promotional merchandise for their events, campaigns or fundraisers. The tote bag is one of the most popular promotional products due to the amount of space it offers for the print and the fun you can have with the design. They’re also super useful and virtually always well received. This offer includes a high quality screen print on one side of your personalised tote bags, in one colour. The bag used in this brilliant offer is made of 100% cotton and has a generous capacity of 10 litres. It measures 38 x 42cm, making the perfect shopping bag or for everyday use. With a handle length of 67cm the bag can be carried by hand or over the shoulder. 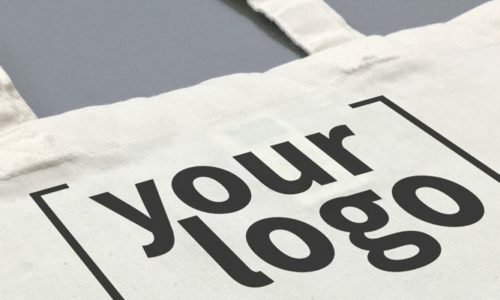 The use of personalised printed tote bags is an excellent way to get your brand known and they work just as well if you want to promote a concept or spread a particular message. In terms of using them as promotional merchandise at events, these highly economical 100% cotton bags can have a huge impact and they’re the perfect product to give away as freebies. Whether you decide to use them as a promotional product, to give them away in your shop with every purchase or to present them to your clients or staff, they will no doubt generate sales. How? It’s very simple: every time someone uses the bag they will be promoting your brand, for free! Even more so if you have an attractive, eye-catching design. These days, if you go out onto the street, you’ll see printed canvas bags everywhere. So, for any company that wants to give a touch of style to its branding, consider the fashionable tote bag, and remember that it can also be used as original packaging. You can carry this bag around comfortably on your shoulder. Size of the bag: 38 x 42cm. Print area: 36 x 33cm * in special cases this area can be expanded. You can consult one of our printing experts for more information on printing sizes. If you need the bags sent by express delivery, no problem! Though this will incur an extra cost. Using the latest screen printing techniques, we can guarantee that all designs are produced to the highest standard. Our team takes care of checking that your design is in the right format and of a high quality for printing. You can supply your design’s PANTONE code if necessary. If you want to find out more, get in touch with someone from our sales team and they will be more than happy to clarify any doubts and get the printing process started for you.